Having eaten our way around South East Asia over 6 months and gained the pounds to prove it, it is fair to say that Millie, the Elk and I have acquired quite high standards when it comes to Malaysian Food. Satay Kampong is the second restaurant where we have sampled Malaysian fair since returning to the capital armed with experience of the real thing, and it took our fancy for a causal Friday night meal to escape a particularly gusty evening. Admittedly we did choose to dine early, but there was a notable lack of atmosphere as we wandered in. There was no background music to fill the lofty interior, and only a few other diners whose chatter was reserved to say the least. If you can grab it, the balcony mezzanine type seating is the best spot to watch the hustle and bustle of the Courtenay precinct on a Friday night. I had the seafood mee hoon ($15) and an onion pratha ($3.50) which were both decidedly lacking. The mee hoon looked akin to the fare of the streetside woks in Melaka, but it was relatively bland in comparison and gave off none of the alluring heady aroma-advertising. The onion pratha was a let down. It was a pre-frozen slab filled with onion salt or something similar that had no resemblance to the flaky buttery layers of a freshly-flipped-off-the-hot-plate pratha I’d experienced throughout Singapore and Malaysia. The plain roti ($3) that accompanied the vegetable curry ($14) was an improvement on the pratha but still lacked authenticity. However, the vegetable curry was reported to be rich and flavoursome and packed full of veges and tofu. The Penang Laksa ($15) was also reported to be true to authentic form with a sour broth of tamarind, lemongrass and galangal, and a healthy garnish of cucumber, bean sprouts, and onions. The servings were all large, and were served promptly albeit without a smile. While inexpensive, the fare was hit-or-miss and the service could only be described as ‘wham-bam-thank-you-maam’-esque. Recommended only if you are with a big crowd and able to generate your own atmosphere. A suggestion for Malaysian: Try KK Malaysian on Ghuznee. The char kuey teow there is to die for. 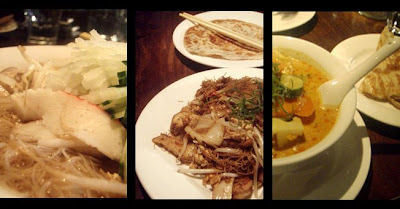 If you're looking for a really nice Malaysian restaurant, try Kayu Manis on Cuba St.